Jewels on Ninth loves to be a part of the big day; the special moment; the ultimate proposal. When a cupid-struck neighbour wanders into our shop, we do everything we can to help them find the perfect ring to surprise their loved one with—no matter how fabulous or crazy their ideas sound. Custom-made, or carefully selected, all of our shoppers leave excited to spend the rest of their lives with the ring they’ve chosen. July 9th was a special day for Lacey Sudo and Callen Kozniuk. They spent the day cruising between the clouds above Whitefish, Montana, but that’s not all. Lacey said yes to Callen and the sparkling ring he chose for her. Even though their feet are on steady ground now, the couple is still on Cloud Nine. 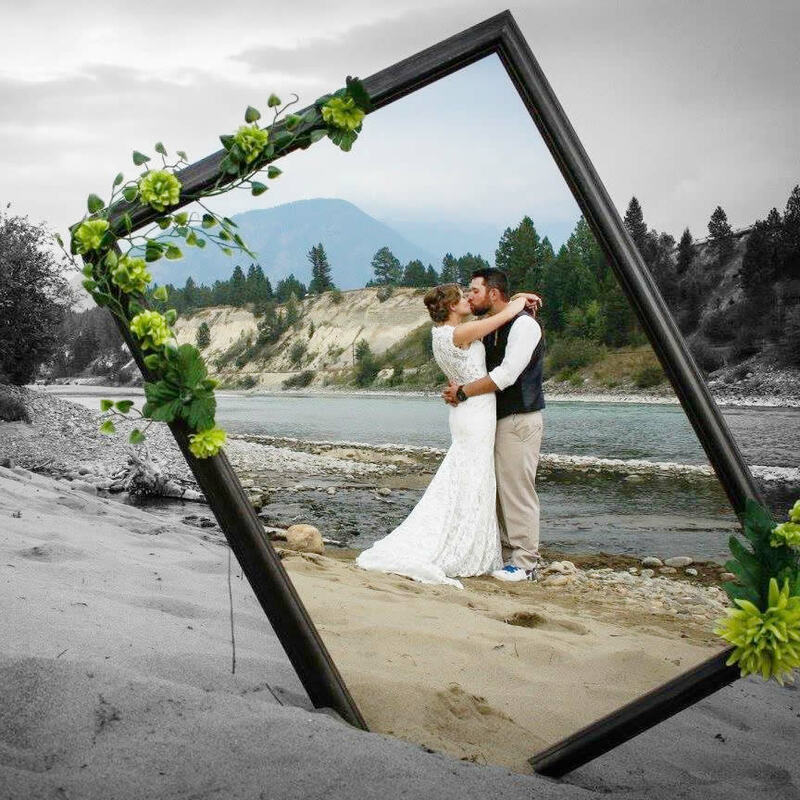 Sarah and Patrick O’Donnell along the banks of the picturesque Kootenay river. Sarah O’Donnell is not your typical, jewellery-loving girl. “I learned that early on in our relationship,” said Patrick. He bought her a heart necklace for Christmas: “We returned it and got a coffee table set.” For this reason, Patrick O’Donnell knew that his special lady would need a custom ring if he wanted her to wear it for the rest of their lives. One straight off the shelves just wouldn’t be enough to catch Sarah’s love. Excited to pop the question, but unsure of where to begin looking for the perfect ring, Patrick arrived at Jewels on Ninth. “I got super lucky,” he said. “The store owner—Heather—greeted me and made me feel a little less nervous. She asked me all the right questions, and was very positive and excited to get the process started.” Five weeks later, Patrick’s perfect ring arrived. Onto popping the question. Patrick first tried to ignite his love for Sarah in the form of a homemade light-up sign that read “marry me.” However, technical difficulties resulted in three dead batteries, and no proposal. Second, Patrick prepared a home-cooked dinner—crab legs, mussels, and a diamond ring for desert. Patrick didn’t know that he was cooking for three until his friend stopped by to hang out for a few hours. Romance out the window, nervous, and tired, Patrick put away the ring for another day. A year later, Sarah and Patrick married. “I still catch her staring at her rings now and then,” said Patrick. Clearly, the custom diamond and Patrick’s charm caught Sarah’s heart. Rachel Moneyman and Stephen Rolland on the sandy shores of Kootenay Lake. Stephen Rolland proposed to Rachel Monkman in the most picture perfect way—and he has the photos to prove it. “I had the ring for a little more than a week and was waiting for the right time to ask Rachel,” he said. “She wanted to go to the beach because we were having some really nice weather. I thought that would be a great place to ask her.” Ring box carefully tucked away in his tri-pod case, and camera ready to go, Stephen and Rachel set out for the beach. Stephen set up the camera and for a family photo of the couple with their dog. “On the third take, I got on one knee and nervously asked Rachel to marry me.” As if Rachel’s expression—caught on camera—isn’t enough to make this proposal picture perfect, the sandy beach and mountain backdrop seal the deal. Jaycee Hunt gets a pleasant surprise when she reaches for more shells. Lane’s plan played out smoothly from there. He asked Jaycee to get out of the quad to help him reload their clips. “I asked him for the box of bullets, and he starts shaking them into my hand,” she said. “And out comes a ring!” Jaycee was shocked. “He grabbed the ring and got down on one knee to pop the question,” she said. “I balled like a baby and obviously said ‘Yes!’” It may have been a bit “redneck,” but Lane sure shocked his bride-to-be in the best way. Tyler Stapleton surprises the love of his life, Brittney Pocha, after sledding to the top of a mountain. Brittney Pocha's dream engagement ring. Tyler Stapleton wanted to surprise his long time girlfriend Brittney Pocha with his marriage proposal, so he made sure only the necessary people knew about it. "I wanted Brittney to be the first one to see the ring,” Tyler said. (How sweet is that?) He took her sledding in the mountains on a gorgeous day, and with some help from Brittney’s dad and brother stopped in a scenic spot. Tyler got down on one knee and gave Brittney ... a rock. When the stone cracked open, inside was her dream engagement ring. Now that's a rock solid love. Got an engagement story to share? Let us help you celebrate your love with a diamond to match the darling of your dreams. Have you already shopped and popped the question? We want to know exactly how it happened! Email photos and your story to Jewels on Ninth. Guys, are you looking to purchase an engagement ring? You should check out the Jewels on Ninth guide to selecting the perfect ring for your fiancee. We promise that we can show you how to buy an engagement ring that she will adore (almost) as much as she adores you.